Dorman offers 100 percent new mechanical vacuum pumps. Radial ball bearing design provides greater load capacity for improved durability. The unit creates vacuum to operate various accessories throughout the vehicle. 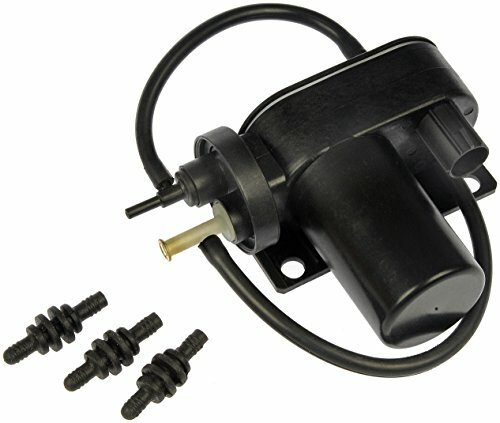 DIRECT REPLACEMENT: This Dorman mechanical vacuum pump is specifically engineered to match or exceed the original design and performance of the original vacuum pump on select Ford Excursion, Ford F-250 Super Duty, Ford F-350 Super Duty, Ford F-350 Super Duty, Ford F-450 Super Duty, Ford F-550 Super Duty, Dodge Ram 2500, and Dodge Ram 3500 pick-ups from 2007 to 1999. COMPLETE KIT: For a complete repair, we've included three mounting grommets. HIGH-QUALITY: Dorman's complete pump assembly is manufactured with all new materials for an extended, reliable service life. QUALITY TESTING: This part has undergone extensive vehicle try-on and durability testing to ensure a trouble-free performance.